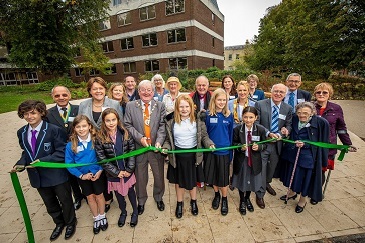 The Peace Garden was opened on International Day of Peace, 21 September 2018 by The Mayor of Basingstoke and Deane Cllr Seán Keating. 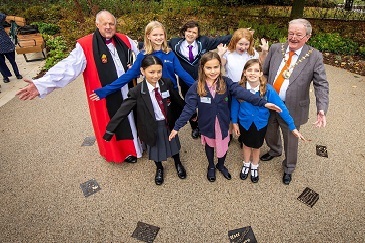 The Bishop of Basingstoke, the Right Reverend Canon David Williams, blessed the garden and expressed his hope that the garden would symbolise the link between those past and present who promote peace and reconciliation. The project was started in 2014 at the time of commemorations for the start of the First World War. The idea was to create a space which would celebrate peace, to be opened in 2018, the centenary year of the end of that war. 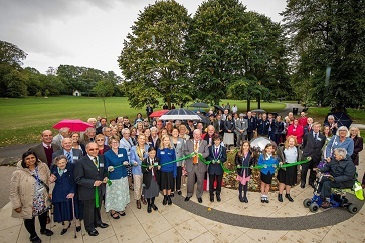 The garden was delivered by the Peace Garden Advisory Group, supported by Basingstoke and Deane Borough Council and local sponsors and donors. 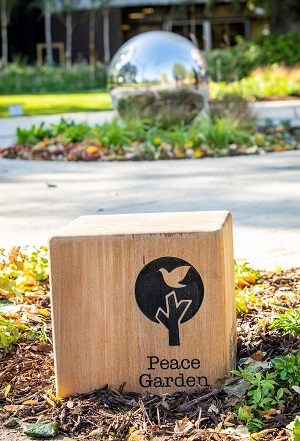 The aim of the Peace Garden Project was to create a lasting celebration of peace and reconciliation, which will provide a relaxing space in memory of all who suffered in past conflicts and which reflects our hopes for lasting peace in the future. The design is based around a circular theme reflecting ripples in a pond extending outwards. 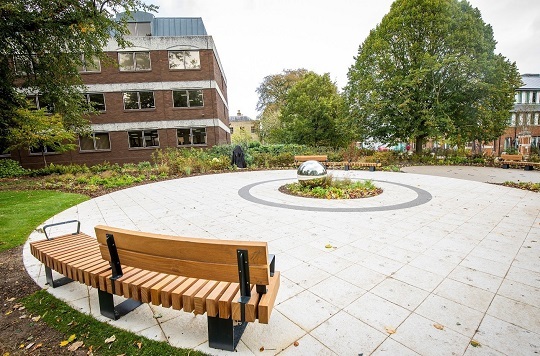 The paving and planting have been designed to create a calm and reflective space. A stainless steel gazing ball in the centre of the garden reflects the sun and clouds as they move across the sky. A total of £40,000 awarded from the Council's Local Infrastructure Fund. 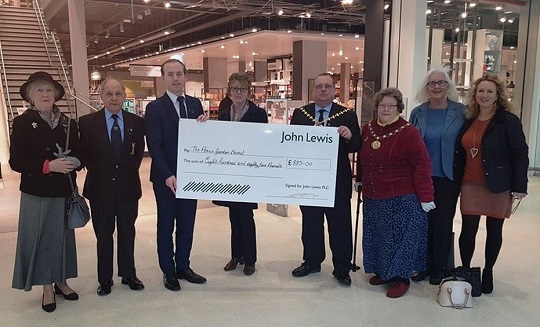 Public donations of funding from the Rooksdown Club £12,605, John Lewis Partnership £885, Basingstoke Heritage Society £300, Basingstoke Veterans £200, Debbie Reavell £75, Tammy Lake and Judy Brown. 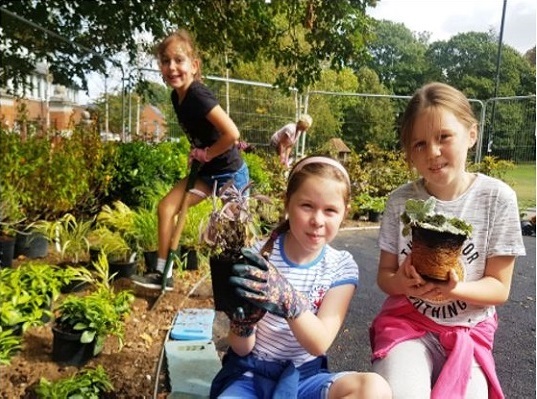 Donation of works and materials by Gristwood and Toms (tree surgery), Kieron Beattie Landscapes (tree and shrub planting and maintenance), Steven and Ruth Evans (donation and planting of bulbs), Wildflower Turf Ltd (supply of wildflower turf and seeds). 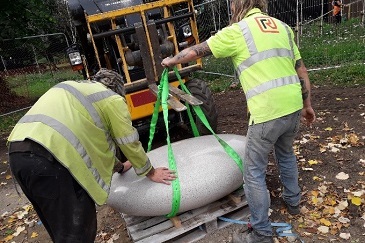 Barrell Sculpture Ltd supplied the Barrell Pebble Seats. 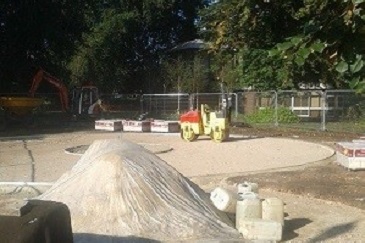 Rocon Ltd installed the paving and other features. 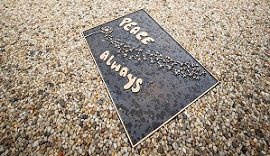 Local schoolchildren entered a competition to create a design that illustrated “What does Peace mean to you?” The winning entries which were chosen by members of the Advisory Group were transformed into 10 bronze plaques which are set into the paving within the garden. 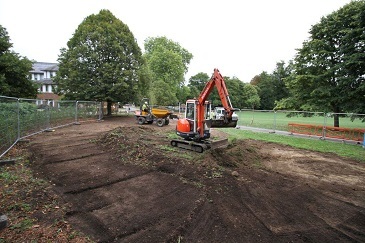 Below are photos showing the progress of the Peace Garden, starting with images of before and after the work was carried out. Peace Garden Advisory Group members planting one of the birch trees. The Mayor of Basingstoke and Deane Councillor Sean Keating, Maria Miller MP, the Bishop of Basingstoke the Right Reverend Canon David Williams, the Peace Garden Advisory Group (Pip Iles – Chairman, Catherine Waters-Clark, Debbie Reavell, Stephen Evans, Stephen Pashley and Tammy Lake), Julia Beer (Sculptor), Dr. Andrew Bamji (Sir Harold Gillies Archivist), patients of Sir Harold Gillies, Landscape Architect Catherine Daly, Project Manager Margaret McGrath and winners of the children’s art competition. There is also a sculpted bust of plastic surgery pioneer Sir Harold Gillies, commissioned by the Rooksdown Club and sculpted by Julia Beer. Sir Harold pioneered facial plastic surgery for wounded servicemen during the Second World War, while based at Park Prewett Hospital, now Rooksdown, Basingstoke. Many of his patients were rehabilitated with the help of the residents of Basingstoke. There is further information about Sir Harold at the bottom of this page. 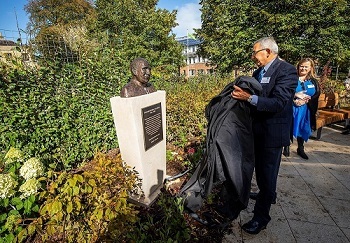 Members of the Rooksdown Club, including patients of Sir Harold, as well as members of his family attended the opening of the garden to witness the unveiling of the bust by Dr Andrew Bamji, the official Sir Harold Gillies archivist. Sir Harold Gillies, a New Zealander, was the leading pioneering surgeon of his time and during the First World War firstly, after being ordered there by the War Office, at the Cambridge Military Hospital, Aldershot in 1916, and then at the Queen's Hospital, Sidcup which opened in 1917, he pioneered new surgical techniques, and modern plastic surgery was born. Apart from his surgical acumen, Gillies dedicated much of his time to considering the severe psychological trauma which his patients had been through, and how they could be rehabilitated back into society. His prominent role during and following the First World War inevitably led to his being asked by the government of the day to seek out and set up a suitable treatment unit for the wounded arising from the Second World War. Thus he came to Park Prewett Hospital and identified that part of it, Rooksdown House, as a suitable location for the plastic surgery unit. That unit continued in existence until being transferred to Queen Mary's Hospital, Roehampton, London in 1958. Perhaps what is less well known is that the Rooksdown Club set up at Gillies' inception followed on from his dedication after the First World War to the psychological rehabilitation of the Second World War wounded. This Club, founded in 1945, brought into play the role that the general population of Basingstoke played in accepting and helping these unfortunate disfigured individuals back into society. The Centenary of the ending of the First World War is a fitting time to honour the role of Sir Harold Gillies C.B.E., F.R.C.S. 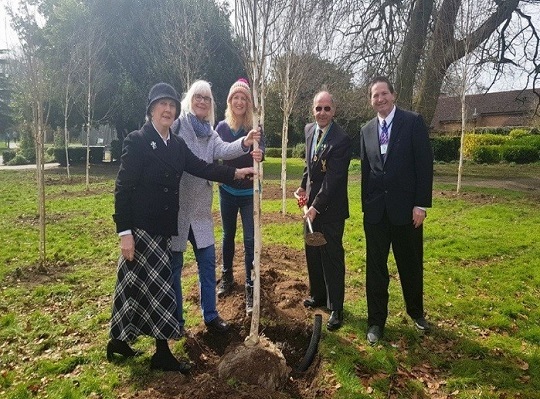 in pioneering plastic surgery for the war-wounded, and that his presence in Basingstoke during and after the Second World War should be marked by the raising of a memorial to him at a suitable location in Basingstoke. 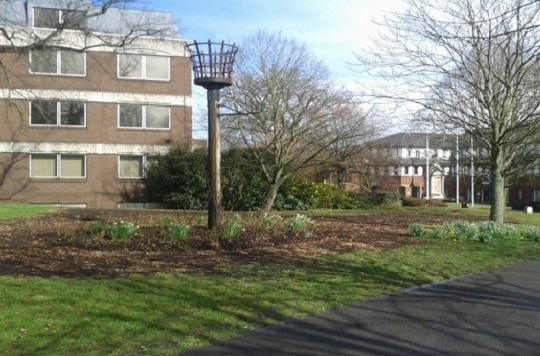 On approaching officers of Basingstoke and Deane Borough Council during 2014, it was indicated that they would like to locate the bust in the planned new Peace Garden to be inaugurated in 2018. The Rooksdown Club commissioned sculptor, Julia Beer, to model a life-sized bust cast in bronze and to be mounted on Portland stone. This bust reflects the remarkable contribution that Sir Harold Gillies made in the physical and psychological rehabilitation of those war-wounded who gave so much that current and future generations can live in peace. This note is prepared by Stephen Evans, Rooksdown Magazine Editor and Peace Garden Advisory Group member.